Triangle - Knife for vegetables - Double Blade The short blade and straight knife is toothed on one side and the other wavy. And 'excellent tool for sculptors of fruit and vegetables. Potatoes, carrots, zucchini, turnips, melons, pumpkins, apples, pears each vegetable or fruit can have a wavy shape. The notched side of the knife is ideal to clean, decorate and cut fruits and vegetables in their skins: tomatoes, apples and kiwi. The knife was for vegetables blade length of 8.5 cm. It is made of tempered stainless steel. Thanks to the polypropylene handle, the knife Triangle is resistant to washing in the dishwasher. Ideal for students of hotel school, chef restaurants, lovers of creative cuisine. Triangle - Crinkle Cutter The triangle crinkle cutter is the ideal kitchen tool for a quick decoration of raw food. The crinkle cutter is made from high quality stainless steel. Fruit or vegetables cut with the crinkle cutter is always a hit with everyone, especially with children and has an appetizing effect on every party. Ideal for students of hotel school, chef restaurants, lovers of creative cuisine. Triangle - Pizza cutter SOUL, walnut wood "Soul" stands for passion, warmth and beauty. For aesthetes and passionate chefs, the traditional Triangle company Triangle has developed a line that meets the highest demands. The special shape of the handles and noble fruit and walnut woods underline the value and the timeless character. The hand caressing handles are available in cherry, plum and walnut wood. The series "Soul" includes a pizza cutter and a fine planer, which are manufactured in manufacturing work and with high standards of quality, timelessness and functionality. The special quality of this pizza cutter is underlined by the carefully sharpened cutting wheel made of hardened special steel as well as by the double guidance of the wheel. Here is the short, wide handle its strength: Its excellent power transmission with sliding movements. For the sake of nature, all wood comes from sustainably managed and PEFC-certified German orchards and private forests. The handles are turned in Sauerland, then finely machined in Solingen and assembled with functional parts made of stainless steel. For a long product life, all components such as blades and leftovers are available as spare parts. As an ideal gift, the "Soul" products come in a stylish and reusable gift box. Tasting spoon FinalTouch Season the soups and sauces, try the fried and arrange with the same tool and garnish fine? All this is not a problem with the tasting spoon FinalTouch. The only 17 cm long professional tool combines spoons and tweezers in one and is so compact that it permanently finds space in the sleeve pocket of every cooking jacket. The finely ribbed barrel of the tweezers ensures a secure hold. Of course, the tasting spoon made of stainless steel is dishwasher safe. Triangle - Fine slicer SOUL walnut wood handle SOUL stands for passion, warmth and beauty. For aesthetes and passionate chefs, the traditional Triangle company has developed a line that meets the highest demands. The special shape of the handles and noble fruit and walnut woods underline the value and the timeless character. The hand caressing handles are available in cherry, plum and walnut wood. Fine slicer - With Safety Guard Easy to grip fine slicer with safety guard. When extra fine is needed such as truffles, mushrooms and much more. Nothing stays behind, because the well-thought-out rest holder allows recycling to the last slice. For the sake of nature, all wood comes from sustainably managed and PEFC-certified German orchards and private forests. The handles are turned in Sauerland, then finely machined in Solingen and assembled with functional parts made of stainless steel. For a long product life, all components such as blades and leftovers are available as spare parts. As an ideal gift, the "Soul" products come in a stylish and reusable gift box. The triangle carving tool set basic whips up little works of art: The carving tool set basic offers the perfect tools for starters. The carving tool set basic contains the three carving tools M, A2 and E2, which allow learning the basics of carving. The carving tool set basic is made from hardened, stainless steel and sharpened. The handles are made from non-slip material and guarantee like this a safe working. Triangle - Pumpkin Carver 2-pieces - V-carver and the U-carver short Scary Halloween faces probably are the true nature of most decorative pumpkins in fall season. What a shame as this vegetable is so nicely usable for a broad variety of decorative set-ups. With Triangle pumpkin carving tools basically everything is possible with no harm to hands and kids. Using the triangle pumpkin carver, it is fast, easy and safe to carve out faces but also samples, ornaments or letters for each pumpkin type. The single tools and their field of application: The V-carver for narrow contours The U-carver short for wider contours The carved pumpkins can be hollowed out and illuminated or can serve as natural container for all sorts of fall-minded plants. They will impress your neigborhood and friends anyway. By being watched at your front door or by getting them as a gift. Triangle - pumpkin carving set 2 -pieces: 1.Fruit spoon 2.Pumpkin saw Scary Halloween faces probably are the true nature of most decorative pumpkins in fall season. What a shame as this vegetable is so nicely usable for a broad variety of decorative set-ups. With Triangle® pumpkin carving tools basically everything is possible with no harm to hands and kids. The single tools and their field of application: The fruit spoon removes pumpkin flesh and seeds easily due to its sharpened edges. With the pumpkin saw you can get really creative: Wavy, straight, round,... Letters or words like "Welcome" or names, house numbers, patterns like stars, moon, leaves, hedgehogs, ... we leave it up to you. The carved pumpkins can be hollowed out and illuminated or can serve as natural container for all sorts of fall-minded plants. They will impress your neigborhood and friends anyway. By being watched at your front door or by getting them as a gift. The pumpkin flesh and seeds can be removed easily with the fruit spoon as its edges are sharpened. With the pumpkin saw, you can get really creative with as you can cut out curvy, straight or also square shapes from the pumpkin shell. The 3-pieces triangle pumpkin carving set also awaits you with extensive tips & tricks and includes 9 carving templates for Halloween faces. The tools can also be used for non-pumpkin applications. Thus, for example, you can use the fruit decorator as well as the fruit spoon to create adorable melon baskets to stylishly serve fresh fruit. With the fruit spoon you can also portion ice cream. 1. Triangle - pumpkin carving set 3-pieces Scary Halloween faces probably are the true nature of most decorative pumpkins in fall season. What a shame as this vegetable is so nicely usable for a broad variety of decorative set-ups. With Triangle® pumpkin carving tools basically everything is possible with no harm to hands and kids. The single tools and their field of application: The angle cutter cuots out angles and zig-zag patterns such as triangle lids or eyes, stars or mouths. The fruit spoon removes pumpkin flesh and seeds easily due to its sharpened edges. With the pumpkin saw you can get really creative: Wavy, straight, round,... Letters or words like "Welcome" or names, house numbers, patterns like stars, moon, leaves, hedgehogs, ... we leave it up to you. The carved pumpkins can be hollowed out and illuminated or can serve as natural container for all sorts of fall-minded plants. They will impress your neigborhood and friends anyway. By being watched at your front door or by getting them as a gift. The pumpkin flesh and seeds can be removed easily with the fruit spoon as its edges are sharpened. With the pumpkin saw, you can get really creative with as you can cut out curvy, straight or also square shapes from the pumpkin shell. The 3-pieces triangle® pumpkin carving set also awaits you with extensive tips & tricks and includes 9 carving templates for Halloween faces. The tools can also be used for non-pumpkin applications. Thus, for example, you can use the fruit decorator as well as the fruit spoon to create adorable melon baskets to stylishly serve fresh fruit. With the fruit spoon you can also portion ice cream. Triangle - Clear peppers - accessory for carving - Pepperex ACCESSORY TO REMOVE THE SEEDS OF PEPPERS Cutting Tool stainless steel to remove seeds from peppers. The blade will guarantee a perfect elimination of seeds and white strips of peppers and chillies Stainless steel and plastic handle high-quality non-stick for a good grip. Dishwasher safe. The triangle pizza-cutter quickly portions dough, pizza or sheet cake directly on the tray. The rolling blade of the pizza-cutter is very sharp and only needs to be guided with a little pressure over the pizza. The diameter of the rolling blade of the pizza-cutter is 10cm. The work part of the pizza-cutter from stainless high quality steel and the handle of polypropylene are dishwasher safe. The grip is also big and very comfortable in your hand. To cut vegetable slices is made easy with the triangle® endless julienne cutter. With the endless julienne cutter, endless garlands of hard vegetables such as zucchini, carrots, cucumbers, aubergine, radish, celery or potatoes can be created. The endless julienne cutter is rustproof and dishwasher safe. As indispensable kitchen tools for peeling, garnishing, decorating and carving the Triangle kitchen tools are appreciated by professionals as well as by privat cooks. These kitchen tools should not only lead to a tasty result but the user should also have fun by applying the tools and should be animated to cook. In 1946 the founder of the company laid the foundations for a large product assortment of kitchen tools, which are still produced in Solingen, when he started the fabrication of rotary whisks of solid quality. n line with his slogan, "There's no alternative to functionality and quality", the product range was gradually expanded and successfully marketed over decades, usually under the famous brand names of their key producers. Since the markets and the manufacturing processes have decisively changed in recent years, the third generation of family owners decided to market the products made by the Hill company under their own trade name of triangle®. Under this label, consumers and the trade have access to a product range covering over 300 different kitchen utensils - marketed all over Triangle 3-piece Slicer Set is perfect for creative vegetable dishes. There are no limits to creativity from fine and delicate vegetable carpaccio to a delicious Mediterranean grilled vegetable quiche. With exchangeable blades in 1 mm, 2 mm und 3.5 mm thickness. Suitable are all solid vegetables such as zucchini , carrots, cucumbers , eggplant , radishes , celery and potatoes . Simply the different knives are to be replaced , the slide without any effort by the vegetables . All parts are rustproof and dishwasher safe . Confetti : set of 2 cutters heart and flower shaped Triangle Creative, unique and easy! You can decorate foodstuffs and drinks with edible pretty flowers and hearts using these Triangle cutters that allow to prepare fruit and vegetable confetti Simply cut a thin slice of fruit or vegetable. Push the cutter on the slice again and again and confetti remain in the funnel. Without using the hands you can throw the confetti on the plate, dish or cocktail prepared. Diameter of cutter heart and flower : 1 cm Total height of funnel cm. 6,5, upper diameter 3,5 cm. Triangle - Siam - Flexible Stiletto knife for decoration Decorations Fruit Carving Stiletto knife-model thai tipped Triangle Siam knife with flexible blade and cutting from one side only, perfect for carving and decoration of fruit and vegetable. Non-slip handle, sharp blade, excellent tool for carving and decoration. Blade length cm. 6 Total length cm. 16.5 Stainless steel and plastic handle high-quality non-stick for a good grip. Dishwasher safe. Triangle - Knife carving and decoration L New knife of Triangle with blade shaped in L, made rigid for carving and decoration fruit and vegetable. This special blade made with cutting edge allows for decorations and sculptures of vegetables and fruit. and dig deep where other blades can not reach the same precision work. Blade length cm. 4.5. The triangle fish tweezers removes safely fishbones from the fish. The two diagonal gripping pliers of the triangle fish tweezers close tightly and precisely and allow like this a safe removing of the fishbones. The triangle fish tweezers is a shapely fish tweezers with straight handle. The triangle fish tweezers is fabricated in Solingen from stainless steel and like this dishwasher safe. ACCESSORIO PER TOGLIERE I SEMI DI FRUTTA E VERDURA Togliere semi di frutta e verdura in modo rapido e senza spigoli, ora è più facile con il nuovo accessorio by Triangle. Con il nostro nuovo intagliatore frutta e verdura, vi aiuterà a svuotare zucchine, cetrioli, melanzana, può essere più agevole anche eliminare le parti centrali di mele o pere. Poi sarà tutto più facile da riempire e decorare. Lama in acciaio inossidabile di alta qualità. Maniglia con materiale ruvido resistente agli acidi organici. L' affilatura su due lati consente di utilizzare l'attrezzo sia a mancini e destrimani. Set of 5 KNIVES DECORATION FOR SOAP AND WAX Set of 5 knives include: Knife decorator "Thai" Carving knife small round blade Carving knife medium round blade and 2 knives with blade V. Set includes mini guide (in English) for soap decorations. TRIANGLE 8 KNIVES AND DECORATION SOAP WAX SET SERIES 2 Set of knives 8 for decoration of soap waxes and similar materials. Suitable for the processing of soap, wax and the similar materials. These tools facilitate the carving of all figurative objects. functional parts made of hardened stainless steel. The handle is a combination of high-value PP. And 'possible to wash it in the dishwasher. A convenient scroll is included in the set. The triangle deco twister contains 2 deco twisters in different sizes. Moreover, the triangle deco twister possesses a removable handle. Thanks to the triangle deco twister, vegetables can be served in a beautiful way. The triangle deco twister is the ideal kitchen helper. Triangle - Set taglia spirale -3 pz - Curler Set Con il pratico set taglia spirale - curler set , le verdure vannno tagliate con facilità per formare spirale decorative di 3 misure. Il taglia spirale é idoneo per cetrioli, carote, patate e molti altri alimenti solidi. Grazie all' impugnatura è possibile una lavorazione particolarmente sicura e veloce. Idoneo per lavastoviglie. La Curler set contiene: 3 taglia spirale in diverse dimensioni e una maniglia smontabile. Antiruggine e lavabili in lavastoviglie. Better eating with kohlrabi flowers, melon stars or wave skewers. With the book "Garnieren & Verzieren leicht gemacht" of Georg Hartung you can easily make of your buffet a feast for the eyes. The book "Garnieren & Verzieren" explains the basics of decoration, so for example color sequences and choice of the tools. The ideas shown by the book "Garnieren & Verzieren" can easily be put into practice, thanks to the step-by-step-explanations ant the fotos. title of the book: "Garnieren & Verzieren leicht gemacht" author: professional cook Georg Hartung 95 pages, many colored fotos, paperback. As indispensable kitchen tools for peeling, garnishing, decorating and carving the Triangle kitchen tools are appreciated by professionals as well as by privat cooks. These kitchen tools should not only lead to a tasty result but the user should also have fun by applying the tools and should be animated to cook. In 1946 the founder of the company laid the foundations for a large product assortment of kitchen tools, which are still produced in Solingen, when he started the fabrication of rotary whisks of solid quality. n line with his slogan, "There's no alternative to functionality and quality", the product range was gradually expanded and successfully marketed over decades, usually under the famous brand names of their key producers. Since the markets and the manufacturing processes have decisively changed in recent years, the third generation of family owners decided to market the products made by the Hill company under their own trade name of triangle®. Under this label, consumers and the trade have access to a product range covering over 300 different kitchen utensils - marketed all over the world. The three-piece triangle® julienne set is composed by a julienne plane with 3 different, exchangeable blades. The julienne set is suitable for all tough types of vegetables, such as zucchini, carrots, cucumbers, aubergines, radishes, celery and potatoes. The blades of the julienne set (3 + 6 mm for spaghetti-shaped, thin and large stripes, 4,5mm for slices) glide without effort through the vegetables. The tools of the julienne set are made from stainless high quality steel and dishwasher safe. The "Angkanas Thai knife" of triangle has especially been developed for drawing fine lines and for the execution of precise cuts. The blade of the Thai knife is made from high-quality stainless steel, hardened, and flexibly sharpened at the top. Like this, the Thai knife can be led with precision and is an important tool for freehand carving. Thanks to the easy-care material, the Thai knife is dishwasher safe. Thai knife - 2 blades by Triangle The double-sided Thai knife contains 2 different blades within one hand tool. The flexible blade returns always back to its original straight shape thanks to the convex cross-section. The hard blade resists also to firm fruits such as pumpkin or melon. Both blades are extremely sharp and ice-hardened. Each comes with a stainless steel cover and is so safe for transport and storage. Lenght blades cm. 4,5 and 4,5 cm. SET ARTIST: Carving tools set 20 pcs. by Triangle For all those who are well versed in the art of shaping vegetables and need high quality, sophisticated but functional tools. 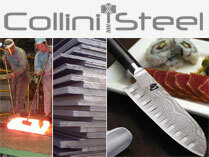 All the knives are precisely crafted, their sizes and shapes carefully matched and the blades finely honed. The functional components are made of hardened stainless steel to allow a long duration of cutting-edge. The handles are made of a combination of high-quality polypropylene and non-slip, soft-grip Santoprene. 19 knives and scoops 1 ceramic sharpener. Practical roll, compact and washable, it can be hanged with a hook and it is provided with an accessory-holder pocket and a space to keep an implement or a pen. The triangl oyster opener is a good helper for opening oysters. Just push the blade of the triangl oyster opener between the two halves of the valve so that the muscle of the oyster is cut; then turn the opener. The triangle oyster opener is made from stainless high quality steel and like this dishwasher safe. The triangle oyster opener is fabricated in Solingen and provided by a black synthetic handle with hand protection.